This fifth article in BDHP’s series on design for people, an actual example demonstrates and reinforces how shifting organizational behavior undergirded the entirety of the design challenge highlighted. Scott Hite, vice president of enterprise real estate strategy, shares how flexibility and agility are the keys to success for TD Bank. Kenneth Freeman, head of innovation for Ambius, shares how even the simplest of biophilic design elements can can increase productivity and reduce absenteeism in the workplace. Where Is the Workplace Headed? Many of today’s companies are putting in place global guidelines that strive to create consistent work and cultural experiences. Design is powerful because its effect on our emotional state is strong. Sally Augustin explores how to use your design power wisely. JLL’s Dr. Marie Puybaraud shares five ways that a high-achieving workplace design can unlock a collective sense of purpose. With Millennials being the fastest growing generation in the workforce, many companies are making major decisions based on what they think Millennials want. But, what does this mean for the workplace of the future? Primo Orpilla shares insight on what informs his design process, measuring the effectiveness of workplace design, and his passions outside of the office. 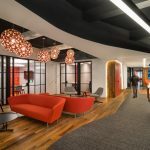 Design should not only be a tactic for recruiting the next generation of talent, but also to to ensure the space equally supports wellness, engagement and productivity for all generations.